In the shadow of 2,200-plus recorded covers of “Yesterday,” it’s easy to dismiss Paul McCartney as one of pop’s great sentimentalists. He’s never been perennially saccharine, but he is the member of The Beatles who punctuated that band’s recorded output with 23 seconds of acoustic picking and murmured pleasantries about the Queen. Even so, he’s been playing and recording for long enough to evade such cheap pigeonholing—and for his undying faith in a hummable melody and whimsical characters like Sailor Sam or Uncle Albert, McCartney has long shown an interest in pushing pop forward. Before John Lennon, Yoko Ono, and George Harrison turned Abbey Road Studios into an instrument for “Revolution 9,” McCartney futzed with tape loops to create the unreleased sound collage “Carnival Of Light”; along with Killing Joke’s Martin Glover, he’s released three albums of electronic dabblings as The Fireman. And in 1980, the artist released McCartney II, one in a small subgenre of punk- and new-wave-inspired albums—like The Rolling Stones’ Some Girls or Fleetwood Mac’s Tusk—by the acts those emerging styles were supposed to exterminate. For his first solo release since the formation of Wings, McCartney stated that he wanted to “just hire a machine” and mess around in his home studio—doing so allowed him to pursue paths of half-cocked (and probably stoned, judging by the album’s dub echoes) inspiration that would be ignored in a big-budget, high-pressure, full-band recording session. The album’s first track and lead single, “Coming Up,” serves as proper introduction to McCartney II’s playful departures. It’s a wound-up goof, a lively blue-eyed soul number that mutated into something stranger when McCartney replaced his fellow Wings with a mechanical one-man band. 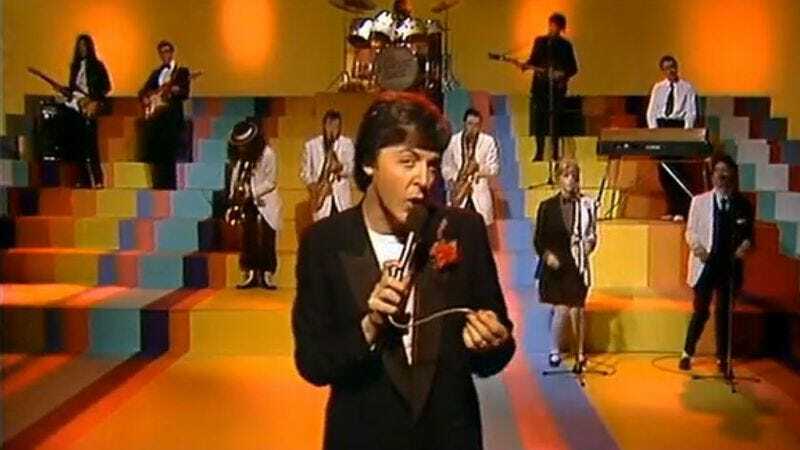 Boasting the frantic guitar strumming of a CBGB-era Talking Heads recording, the studio version of “Coming Up” is rubbery and wacky in distinctly un-McCartney ways—but not even a claustrophobically mixed dance number can get the former Beatle to entirely deny his innate pop sense. By that measure, it’s easily the standout among a set of songs that work better as ideas than they do as pieces of music. (McCartney II immediately illustrates this by following “Coming Up” with the primitive computer pop of “Temporary Secretary.”) It’s heady and immaculately under-produced, two descriptions that can be applied to plenty of entries in the McCartney catalogue, provide you “stick around” long enough to find them.